To view the map, click on the map images below to show a blowup of the map. 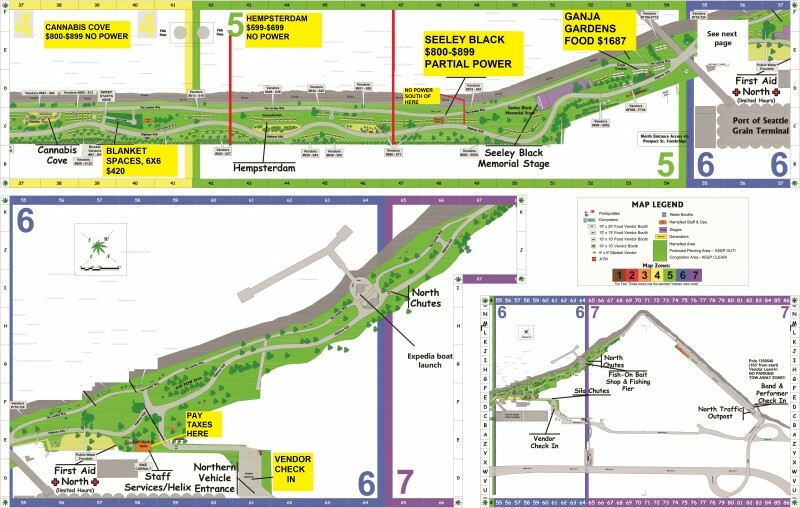 Or click HERE to download a copy of the map (PDF format). 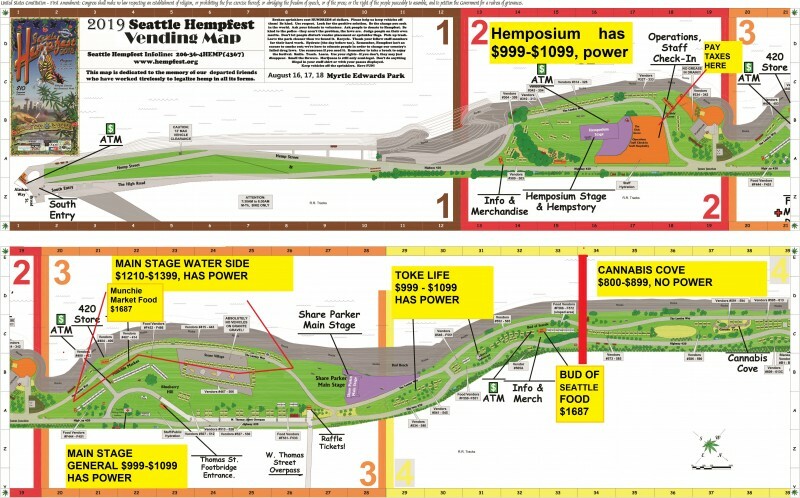 How do you get to HEMPFEST®? To access the North Entrance, cross the Amgen Pedestrian Bridge off of W Prospect Street. It has an elevator and is wheelchair accessible. This drops you at the Caviar Gold & Seeley Black Stages. This is our least crowded entrance and an excellent way to start your Seattle HEMPFEST® Protestival adventure. 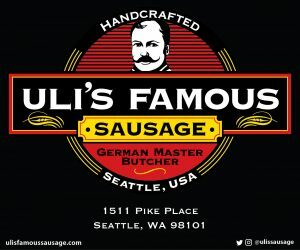 To access our East Entrance, cross the The West Thomas St. Overpass, off of 3rd Ave W & W Harrison Streets, just west of Seattle Center. This new entrance has great parking potential being just 4 blocks west of Key Arena and drops you into Hempfest at Main Stage! 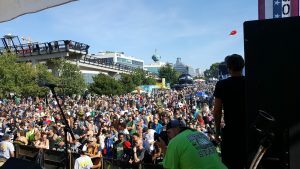 To access the South Entrance, along with tens of thousands of other people, enter the Olympic Sculpture Park on Alaskan Way W. This is the longest wait and walk to get into the Seattle HEMPFEST® Protestival. Of course if your a Seattle HEMPFEST® Member or require ADA entry, you cut the line! Simply walk to the front of the Olympic Sculpture Park and look for the ADA/Member’s Entrance signs. You’ll go get to go through the express lane and get almost immediate entry into the Seattle HEMPFEST® Protestival. General Vendor booths are Green on the map when available. Once they’re sold they are Red. Food Vendor booths are Gray when available. Once they are sold they are Blue. Sponsor booths are Yellow when available. Once they’re booked they are Purple.